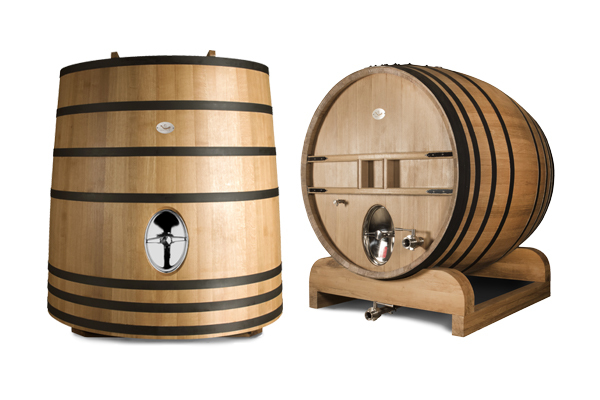 NADALIÉ tanks & casks enable you to combine tradition with leading-edge technology in your cellars. This explains the prestigious references associated with our products. Our manufacturing techniques are applied to the noblest materials. Oak from the best French forests recognized by coopers worldwide, which has been carefully dried and prepared over years in our mills. The accessories that you choose for your specific needs, which have been selected with meticulous attention to quality. With the thermal properties of wood and the control that the accessories provide, you are able to gently steer the fermentation process in ideal conditions. While the ergonomics of the production process are often the initial focus, we also pay special attention to finishing and appearance, which are also of key importance for your image and the reputation of your wines. Our team of coopers is extremely skilled and able to respond to highly customized requests. A wooden tank or cask is a reservoir of aromas that has been patiently built from stringently selected wood then toasted to precise specifications. The toast for large vessels is patiently built up over a period of about 24 hours. This aromatic wealth and elegance will impart complex and subtle wood to your wines, vintage after vintage. We carry out a detailed customized survey of your cellars before installation. This preparatory phase is managed with great care so that nothing is left to chance. Hence we ensure that the equipment we supply will be optimally adapted to your cellar. All our products are made to measure to match the environment in which they are used.